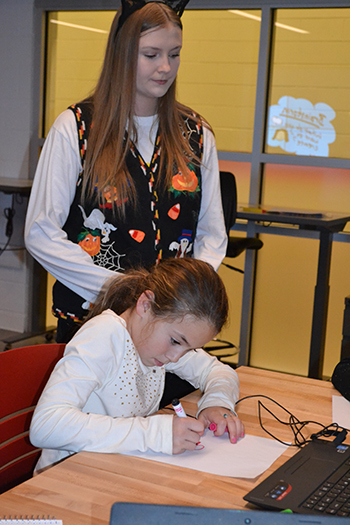 A young "MakerGirl" uses TinkerCAD to make her Halloween-themed design on the computer during a recent MakerGirl session. Excited about having some pre-Halloween fun with STEM, six local middle-school girls showed up at the Armory’s Innovation Lab on Tuesday, October 30th, for MakerGirl. 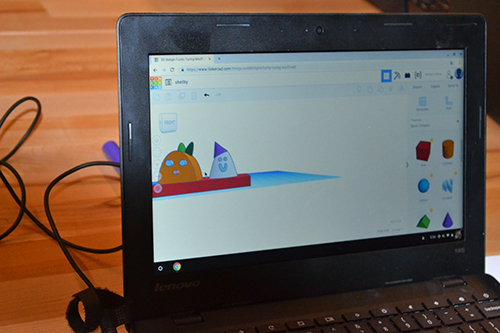 During the two-hour session, the 7–10-year-old girls learned how to use Tinker-CAD, a computer-aided-design application for kids, discovered how 3D printers work, then 3D printed Halloween-related designs they’d made. Plus, currently all the rage and completely apropos for Halloween, they made some ooey-gooey slime. MakerGirl is a STEM education outreach program whose mission is to inspire girls to be active in STEM, to “live and dream as unstoppable forces that say yes to the challenges of the future.” Its ultimate goal? To channel more girls into the STEM Pipeline in order to foster “gender equality in all workplaces,” especially the STEM workforce. 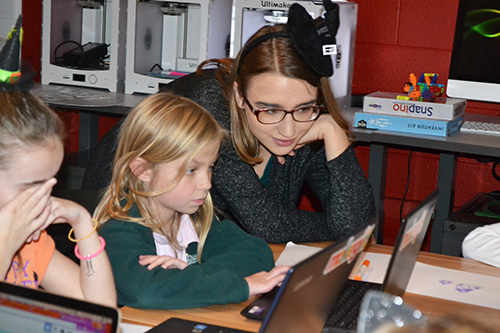 MakerGirl CEO, Stephanie Hein shows young girls the 3D printers. 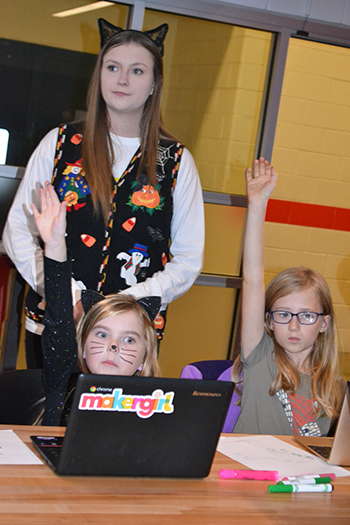 MakerGirl sessions, are usually comprised of 6–10 girls, ages 7–10. Mary Hadley, a senior in chemistry at Illinois and currently the group’s managing and curriculum director, explains why they’re targeting that age group. 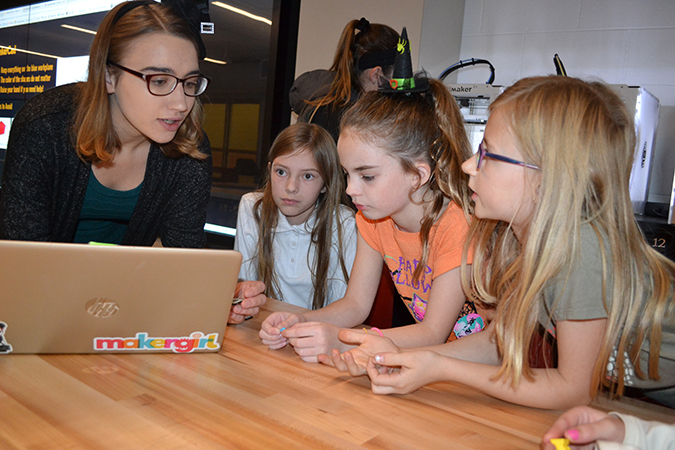 “So we really want to reach that age range right before middle school,” she says, “because we found it's right around middle school when girls start saying ‘No!’ to STEM activities and also just feeling discouraged in their classes.” So MakerGirl picked middle school girls to start with, to try to make a difference with that age group. Éireann Byard works on her halloween design on the computer. Olivia Cole watches as a young MakerGirl participant works on her design on the computer. In addition to the original site at Illinois, another full-time academy was begun at Northwestern University in Spring 2018. Regarding the Northwestern academy, which uses a maker space in one of the campus’ libraries, Hein reports that it’s going really well. “I went to their first session, which was a couple weeks ago, and it was great. It went super well…They're great with the kids, I was very impressed.” Plus, MakerGirl is holding a pilot session at Harvard on November 3rd. In addition to the new academies, in 2016, MakerGirl added a van, which does summer road trips. The first summer outreach, #MakerGirlGoesMobile, put over 10,000 miles on their newly acquired vehicle. During the 8-week-long, cross-country road trip—all the way from California to New Hampshire—they introduced 3D printing to over 1,000 girls in rural and underserved communities across the country. The summer of 2017, a shorter, Midwest version exposed 500 girls to 3D printing. MakerGirl took the summer of 2018 off in order to get Northwestern set up; but are planning an East Coast road trip in summer 2019. During the rest of the year, the van is used to transport 3D printers, laptops, etc. to school or community outreaches. Mary Hadley watches a young visitor draw out her design. In addition to the regular sessions, other outreach activities include at least 2–3 visits a year to mostly Champaign-Urbana schools (they’ve actually visited a Chicago school too). The challenge regarding scheduling mobile sessions is that sometimes team members, mostly college students, after all, aren’t available during the times schools are in session. The group also does sessions at Champaign’s Orpheum Children's Science Museum periodically. MakerGirl has had a significant impact on the current CEO Stephanie Hein, who began her journey with the STEM Ed outreach program her junior year at Illinois while working on a degree in Molecular and Cellular Biology. In fact, working with MakerGirl so inspired her that she went on to get a Master’s of Education degree at the University of Michigan. As the program’s CEO, seeking funding via corporate sponsorships is one of her big roles. “It's definitely a learning curve,” she acknowledges, “but people are pretty open and excited when they hear about our program.” She reports that setting up initial meetings seems to be going pretty well, but that the follow up takes some time. Currently, the three biggest supporters are Johnson Controls, who supported their road trips in the past, along with Abbot Labs and Parker Hannifin. A young visitors spooky design on the computer. Regarding funding, MakerGirl’s first big fundraiser, Chicago Charm, is coming up on November 29th in Chicago. It will be their first time ever trying to raise $10,000 in one night. Those interested in participating can register here. To find out more, see the MakerGirl website or Facebook page. Mary Hadley with two young MakerGirl visitors. Another member who is passionate about MakerGirl is Chemistry senior Mary Hadley. As the managing director, she oversees the directors over five key areas: academies, curriculum, finance, marketing, and internal. As the curriculum director, she’s in charge of all the curricula that’s created. She develops then shares the template for their presentations and sessions with the other academies, who then have freedom to pick the themes and come up with some of their own activities to do during the sessions. As part of their expansion, key stakeholders plan to continue targeting universities as academy sites, because they think their model at Illinois works well. For one, usually a university has a space with 3D printers or one that would share space in order to acquire 3D printers. 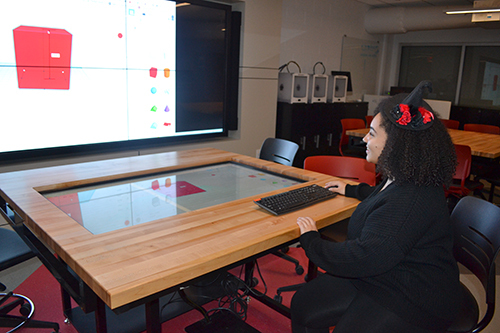 (The Illinois site has just such an arrangement with the Innovation Lab, which allows MakerGirl to use its space for its activities in exchange for using the group’s 3D printers.) Plus, key to MakerGirl’s strategy is having college students who are closer to the kids’ age and are passionate about STEM serve as role models. Olivia Cole shows a design on the big screen. Amy Merkelz helps a young visitor with her design on the computer. Amy Merkelz discussed 3D printing with young visitors.